The word , indicating the place in the wilderness of Ziph where David hid himself from Saul (I Sam. xxiii. 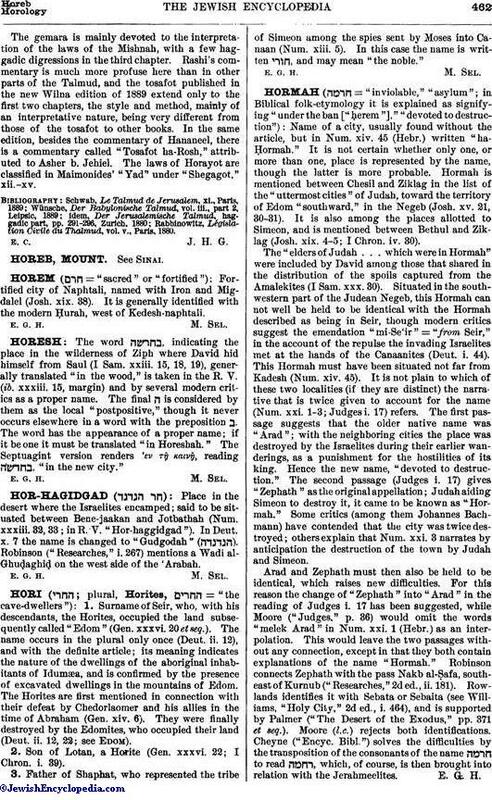 15, 18, 19), generally translated "in the wood," is taken in the R. V. (ib. xxxiii. 15, margin) and by several modern critics as a proper name. The final ה is considered by them as the local "postpositive," though it never occurs elsewhere in a word with the preposition ב. The word has the appearance of a proper name; if it be one it must be translated "in Horeshah." The Septuagint version renders 'εν τῇ καινῇ, reading , "in the new city."